WASHINGTON -- A federal power agency discriminated against wind operators in the Pacific Northwest when it unplugged their generators to cope with a surplus of renewable energy on its transmission system this year, the Federal Energy Regulatory Commission ruled on Tuesday. It ordered the agency, the Bonneville Power Administration, to rewrite its rules. Bonneville had argued that it had no option but to lock out the wind generators to protect salmon in the Columbia River. While the agency could have reduced the power output of hydroelectric dams by routing excess water through a spillway, doing so would violate the Clean Water Act and the Endangered Species Act, it said. Water passing over a spillway picks up nitrogen gas, which is harmful to salmon, although some conservationists say the threat is minor. But a group of wind companies filed a complaint with the energy regulatory commission saying that instead off turning off wind turbines, Bonneville should have resorted to "negative pricing," or paying customers to take the excess power. Bonneville countered that this would conflict with its obligation to repay loans from the federal government and to provide power cheaply. In its ruling, the commission acknowledged "the difficulties facing all sides of this debate." Nonetheless, it said that Bonneville's policy "significantly diminishes open access to transmission" and imposed conditions on the wind operators "that are not comparable to those it provides itself." Bonneville Power's administrator, Stephen J. Wright, said he was disappointed that the commission had issued a ruling because his agency was still negotiating with the wind generators. "The temporary oversupply of energy is a Northwest challenge," he said. "We believe it is the region's responsibility to find the most appropriate way to address this challenge." Part of Bonneville's problem, rooted in the recent rise of wind power in the region, is that storms create an excess of water and wind simultaneously. At such times the agency has given electricity away to neighboring systems, which could then save on burning coal or gas. 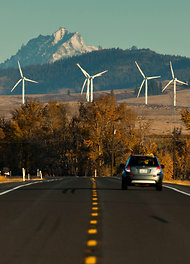 To balance supply and demand this year, Bonneville displaced nearly 100,000 megawatt hours of wind energy from May 18 to July 10, or about 5.4 percent of the amount produced by wind machines connected to its grid. The megawatt hours lost would meet the needs of about 10,000 households for a year. The wind farms not only lost sales but also a federal production tax credit for renewable energy. While the particulars of the surplus may be unique to the Pacific Northwest, the problem of electricity surpluses driven by power sources whose output cannot be scheduled is emerging elsewhere around the country. Electricity production and consumption must be matched precisely at all times, and a surplus can cause blackouts just as a shortage can, engineers say. The problem could crop up more often as companies build wind and solar farms to meet state requirements for renewable energy. Bonneville is currently testing a radical program in which it installs equipment in consumers' homes that can store surplus energy for use later.